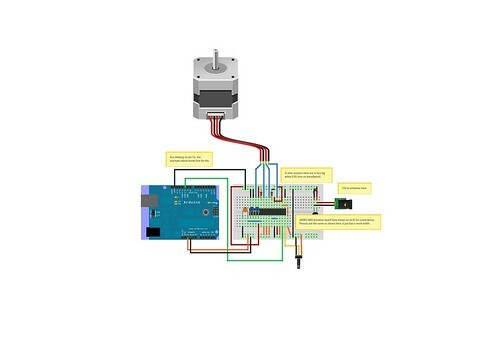 The Smoothie project will use the Allegro A4983 chip to drive the stepper motors. It's a very nice chip, it has 1/16 microstepping, can drive up to 2A, and has the simple step/direction interface. Most common way to use it is via the Pololu Driver Carrier, but in the case of Smoothie, we want all of the 4 drivers directly on the PCB, so that they can share the heatsink/fan, and also share some components. Before designing the Smoothie PCB, it's important to be sure how exactly the A4983 works. 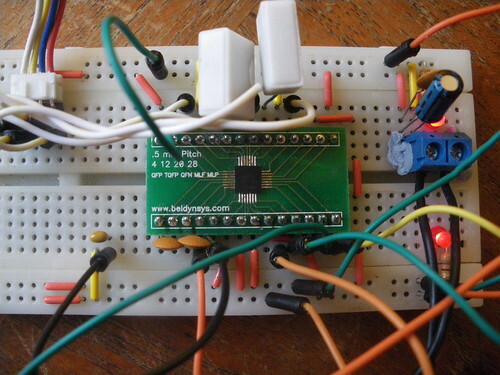 Here is a ( successful ) attempt to use a A4983 on a breadboard. Explanations bellow assume you are already familiar with at least the Pololu board. You can't use the A4983 directly on the breadboard as it's surface mount, so it was soldered on a breakout board, same as the MCP4331 from last post. Again, solder paste + hot air. 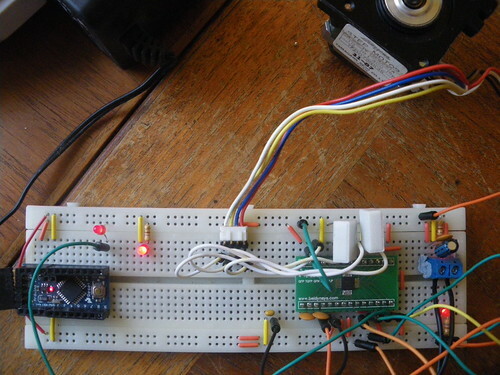 It works fine : the stepper turns, and makes that nice microstepping sound. Also the potentiometer adjusts the current like in the Pololu board. The dir pin is connected to +5V so it only goes one way, that's just because this is a test, just connect it to an arduino digital output, and you can change directions. 3 resistors are missing, if compared to the example in the datasheet. That's because as Smoothie will be USB-powered, we assume the power supply can be trusted. It reduces cost, and gives more free space around the chips ( there need to be no other component around the 4 A4983 so that they can be directly in contact with the heatsink. Next step : controlling the current setting of the A4983 with the MCP4331 digital potentiometer.